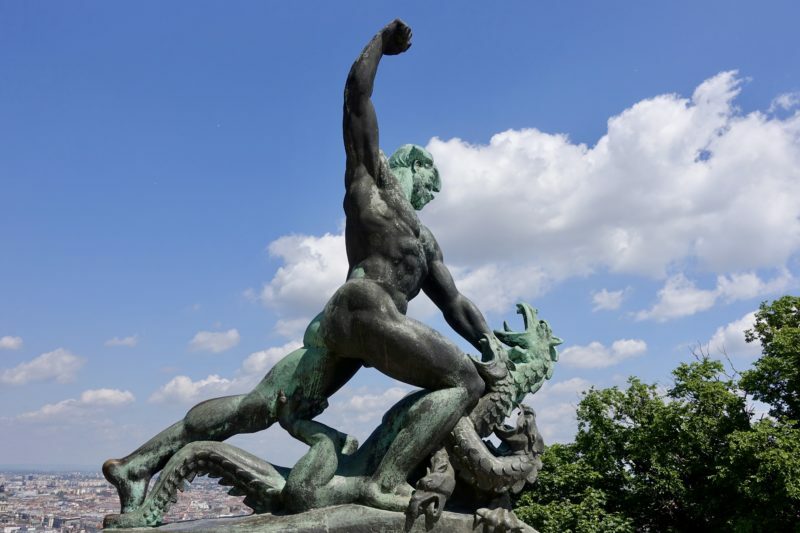 Ahhh, Budapest! We arrived early in the morning after our uneventful overnight train trip from Krakow. We knew we would have to waste some time before we could drop our bags off at our accomodation at twelve, and still couldn’t actually access the apartment until 2pm, the official checkin time. After seeing the rain as we walked out of the train station, Starbucks across the road seemed perfect! The apartment we stayed in was fantastic, so it was worth the wait! It was huge, right in the middle of everything – literally metres from the main shopping/tourist street. 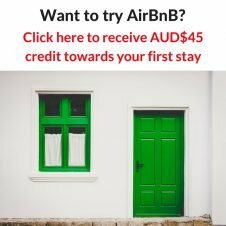 We had only booked it a couple of days beforehand and it was ridiculously cheap, so could not believe it was still available! One room of our apartment. There was a second bedroom/living room, dining room, seperate kitchen and bathroom. We settled in and caught up on some of the boring stuff like washing our clothes. 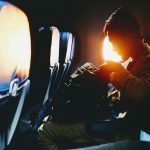 Seriously, it’s one of the hardest things to fit in while travelling. Usually there is no outside washing line to hang clothes up on and no dryer. If we are lucky there will at least be a clothes airer, but otherwise the place ends up with wet clothes hanging all over the place! Sometimes even finding a place with a washing machine is a challenge. With limited clothing in my backpack, I am not above hand washing in the sink if I need to! 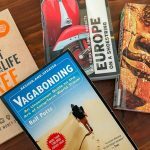 The trials of a backpacker! We spent our first evening wandering along the banks of the Danube as the sun was going down. The weather had cleared up and now was warm and the place was buzzing with visitors and locals alike. 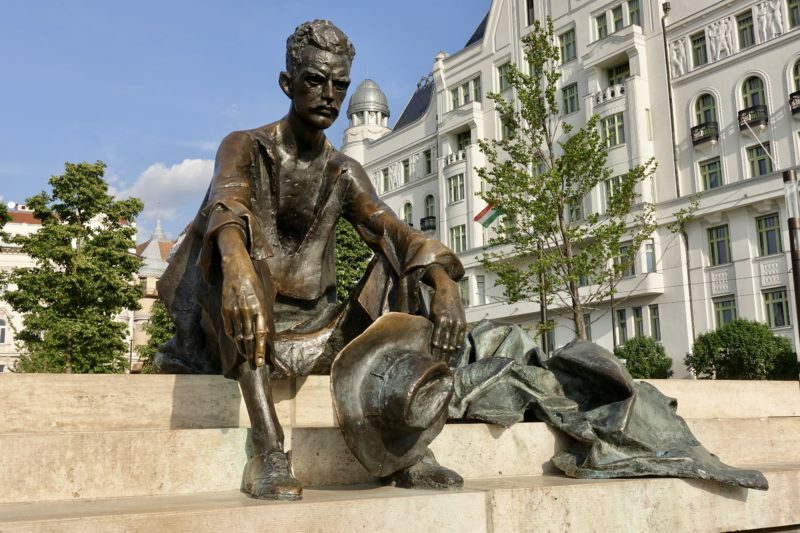 Budapest immediately felt so comfortable. There’s nothing specific that I can put my finger on, just a vibe that this is a perfect city for me to be in. We woke up the next day to more sunshine! 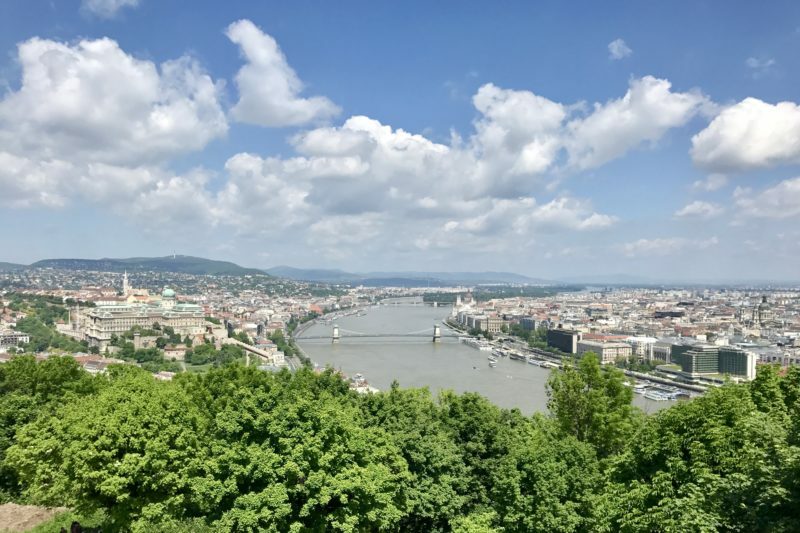 This made it the perfect time to walk up Gellert Hill to look over Budapest and get our bearings. It was a decent climb, but so worth it as the view from the top was spectacular. 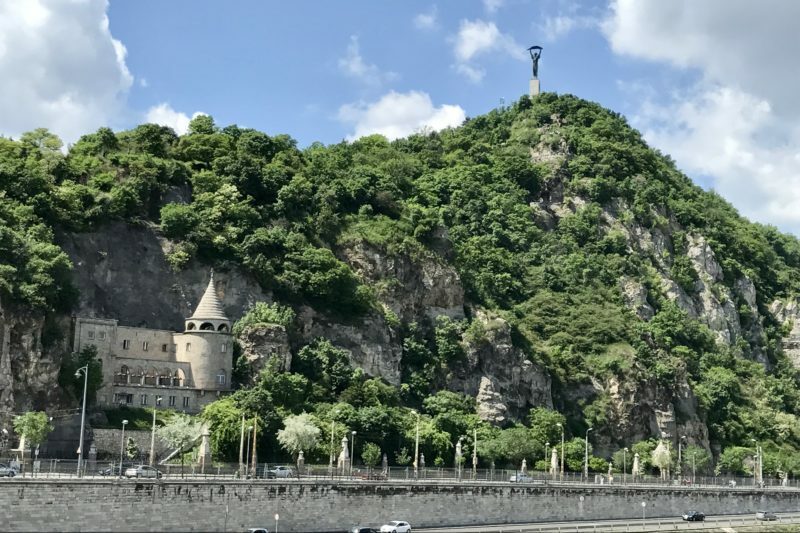 Gellert Hill – we climbed right up to the statue. 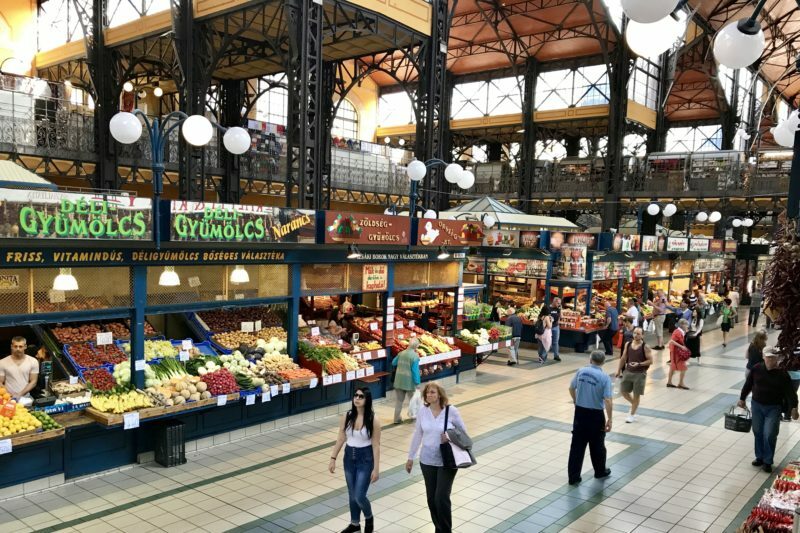 Our stomachs soon called, and we made our way to the Great Market Hall which we had been assured was interesting to visit and had many fresh food stalls as well as food stalls to buy prepared traditional Hungarian meals. What we hadn’t been told though, was that it wasn’t open on Sunday’s! Our next option was to walk towards the Jewish Quarter. Our accommodation host had said we would find better and cheaper food there. 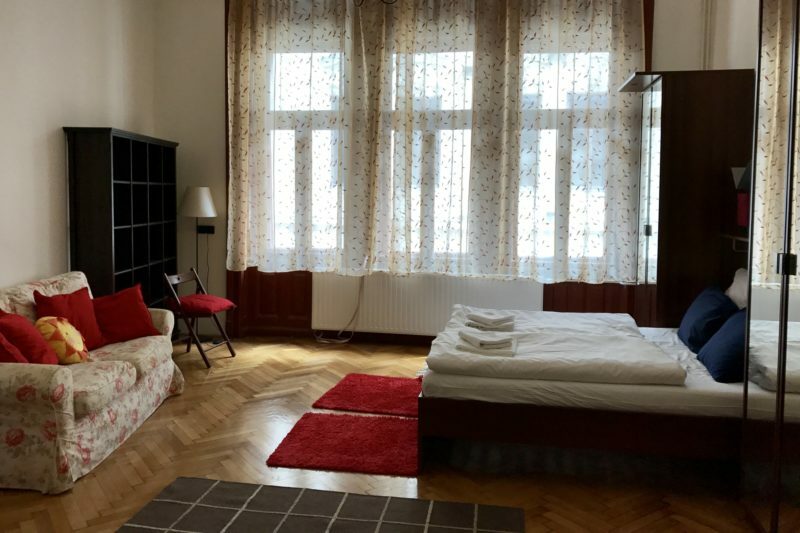 The area immediately around our apartment in the popular Váci Street was aimed at tourists and therefore more pricey. It also wasn’t as good. With stomachs filled with Turkish kebabs for only a couple of dollars each we made our way back to our apartment. 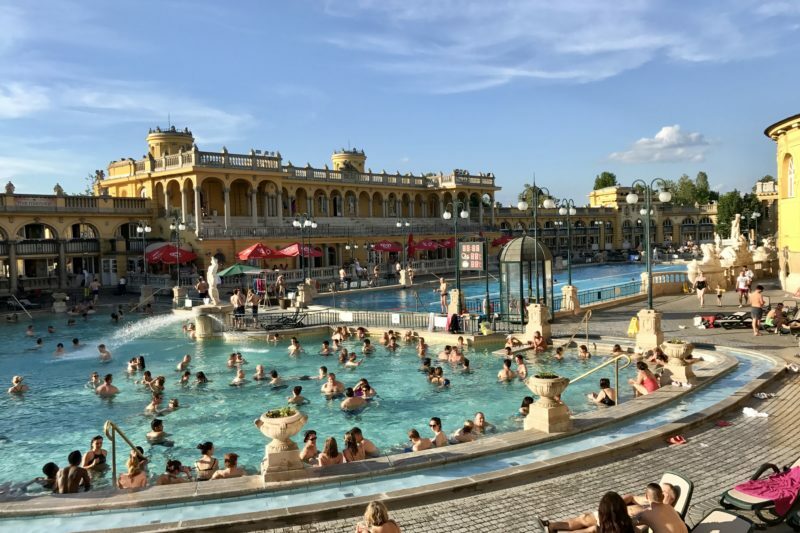 The next thing in our plans was a visit to the Szechenyi Thermal Baths. There was no rush though as I had read on line that they were open until 10pm. These baths are lovely. 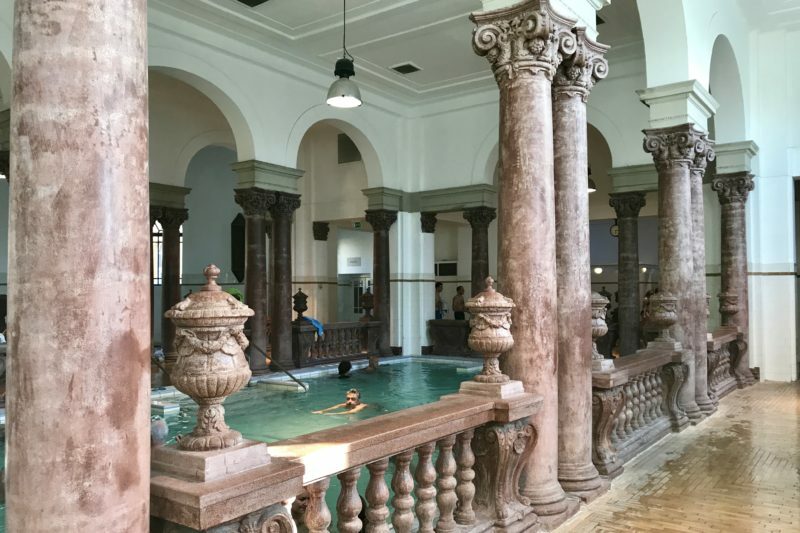 They have been around for years, and there are many indoor heat pools – some up to 40°C – and some huge outdoor pools. We arrived there at around 5pm, and it was still plenty warm enough to want to take a dip. I noticed on the door though a sign saying something about closing at 7pm! Oh no, if I had known our time was going to be shorter, we would have come earlier! 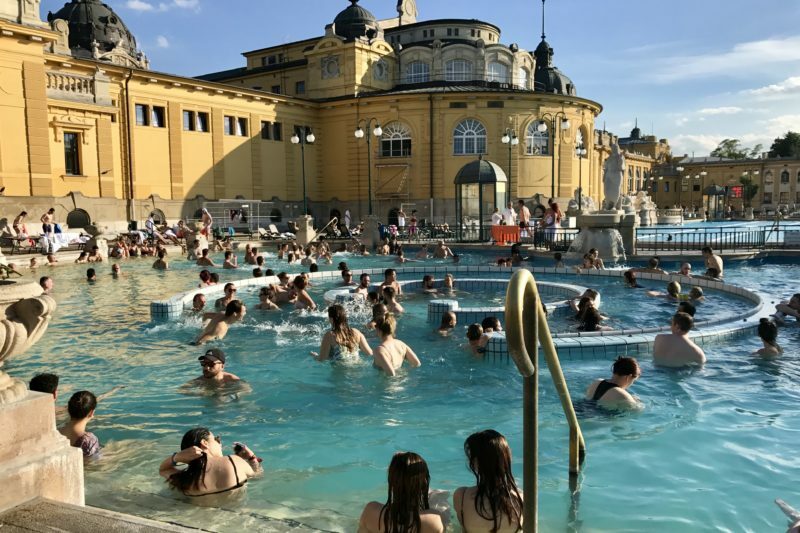 The Szechenyi Baths have fantastic cabins that can be hired for changing and for securely storing your belongings as part of the entry fee, so we got one of these to share. The fun started when we tried to find the outside pools! We walked up and down the maze-like building passing by numerous indoor pools of various sizes and temperatures. We couldn’t see any doors outside though! The signs were a bit vague, and of course in Hungarian, and seemed to point in opposite directions at once! Even after asking, we still couldn’t work it out! The four of us really must have looked a sight going backwards and forwards. Eventually (and I mean at least 5-10 minutes later!) we walked into an alcove on the side of the farthest pool in the building, and there it was, a little porch area that lead outside! We eventually discovered that there was one of these tiny entrances at each end of the building. From the outside they were easy to see. The outside pool was warm and inviting. A lovely clear blue colour. As we sat relaxing in the warm water, jets suddenly appeared, creating a whirlpool effect that was so powerful it was only possible to stand in one place by holding tightly to the walls. Ten minutes later the jets stopped. Different jets seemed to start up periodically in various places in the pools. Later we were sitting on some steps and soon were getting a lovely back massage. The outside baths! The area between the two circular walls turned into a whirlpool! The circular pool at other end of the baths, and the lap pool in the middle. With our time running out, we decided to test out some of the warmer pools inside. The 38°C pool was perfect and I could had laid in there all day! But it was time to go! As we changed again, I noticed that there wasn’t a big rush happening for everyone to leave. Hmmm. As we walked out I looked closer at the sign again. It was only the indoor pools that closed at 7pm, we could have stayed until 10pm outside! Oh well, we had enjoyed our time and still had a big walk back to our apartment with dinner somewhere along the way. 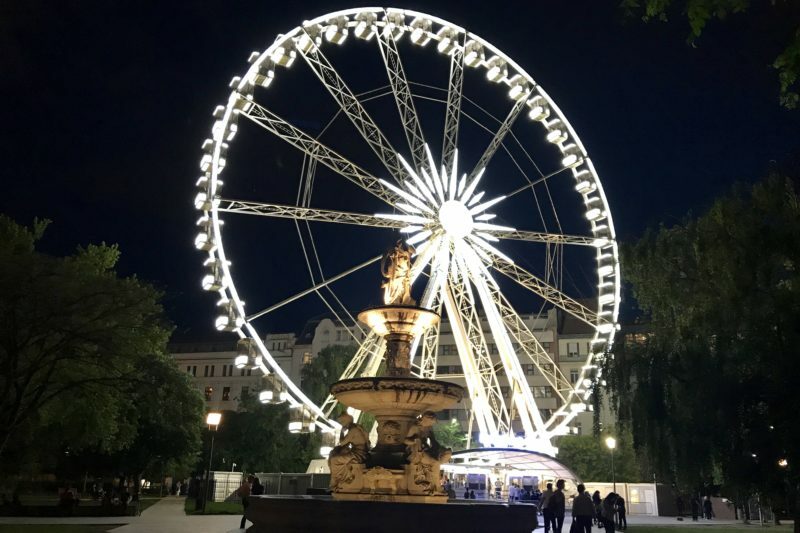 The Budapest Eye – much smaller than the one in London, but still a sight to see all lit up! The next day our plan was to walk around to see some of the sites we hadn’t come across yet! 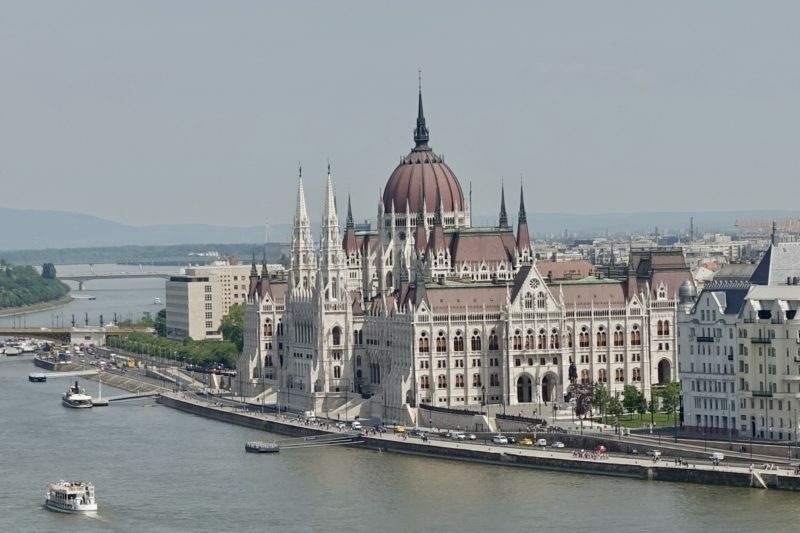 The magnificent Parliament Building, the Basilica, the Shoes on the Danube and a few others. I was checking my emails before bed though, and noticed one in particular – and a good thing I did! 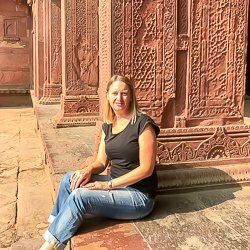 I had booked a walking tour for the next morning when we were back in Adelaide and I had forgotten all about it! 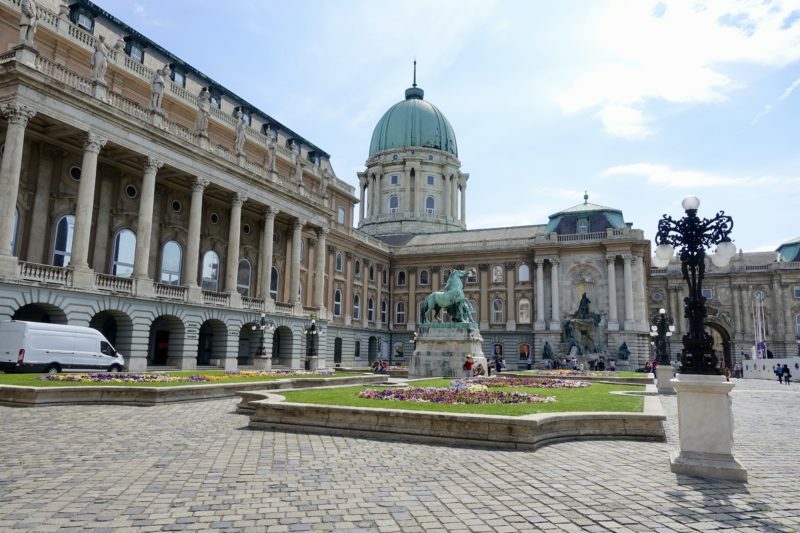 It was the Buda Castle Explorer from Urban Adventures that I had booked. We had a passionate and knowledgeable guide who walked up around the oldest part of Buda including the Castle. 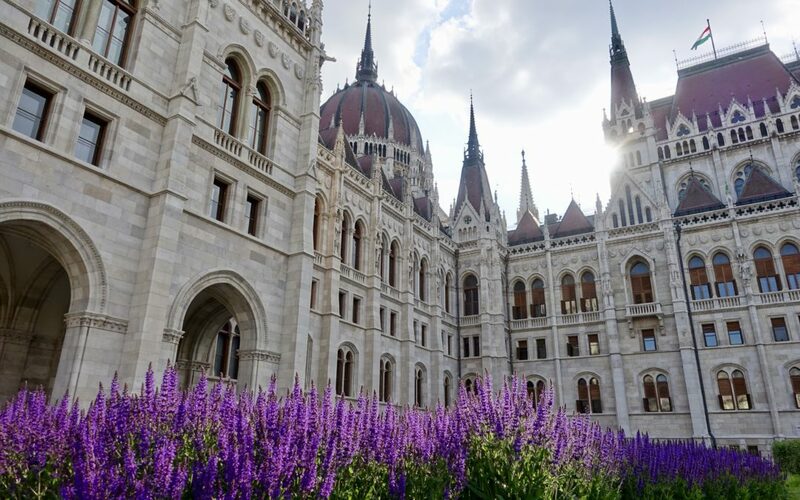 The history is quite different to much of the rest of Europe as Budapest was not bombed during the World Wars and as such still has an older style to it with almost no modern buildings. 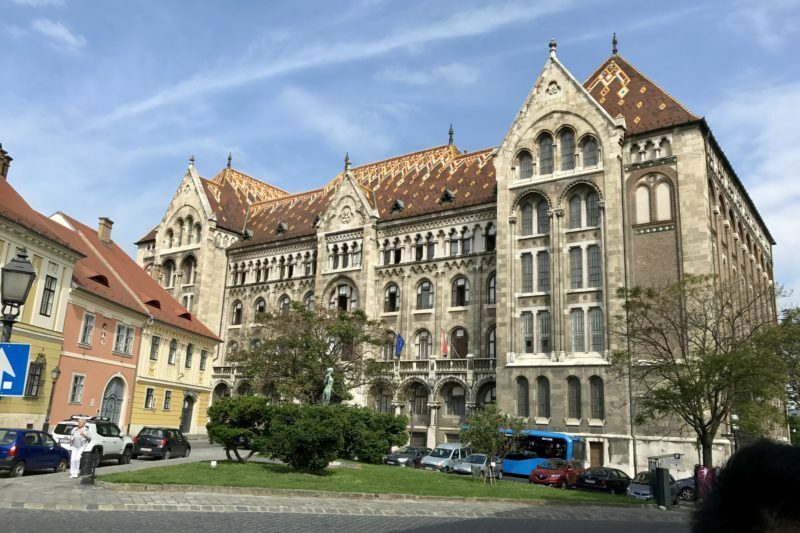 A lovely old-style Hungarian building with a decorative tiled roof. I loved the buildings with this roof! 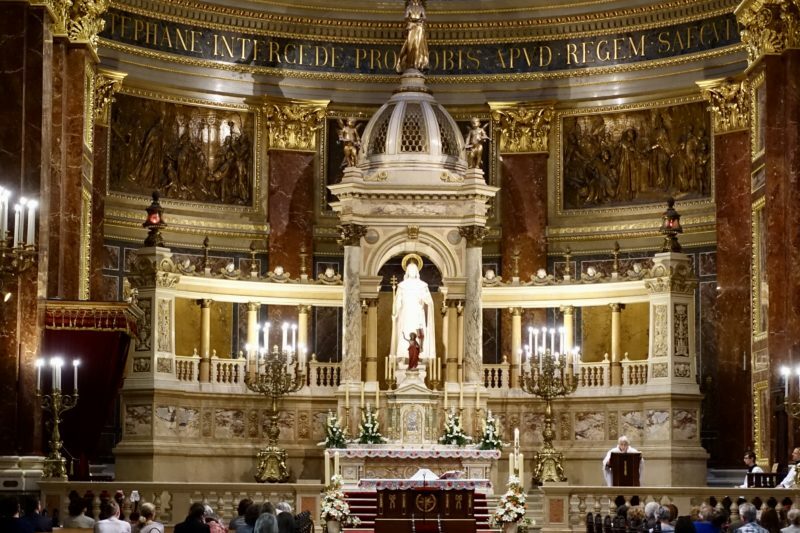 During this trip to Europe we have seen a lot of churches, cathedrals and basilicas, and they are all stunning in their own ways. 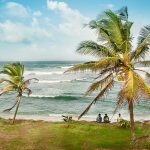 For someone who is not religious, I have become fascinated, and have to look in each one I come to – generally to at least one eyeball roll from someone else in the family! 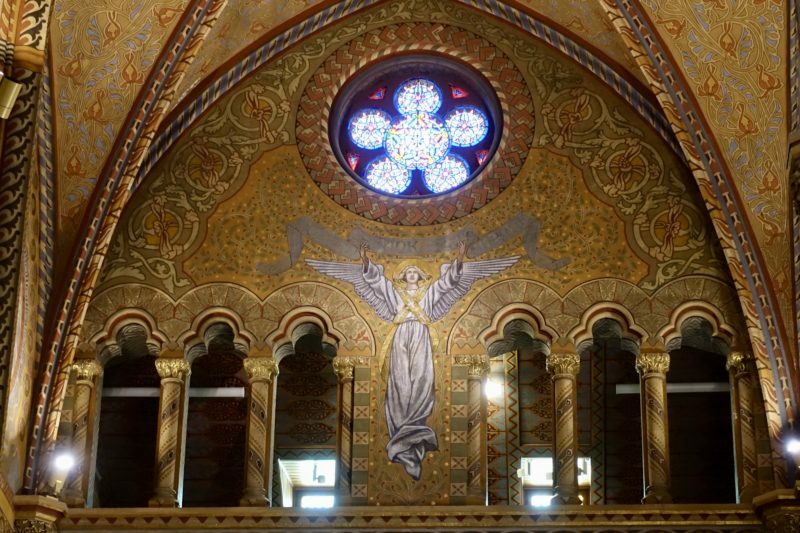 The Matthias Church in Budapest really caught my attention. 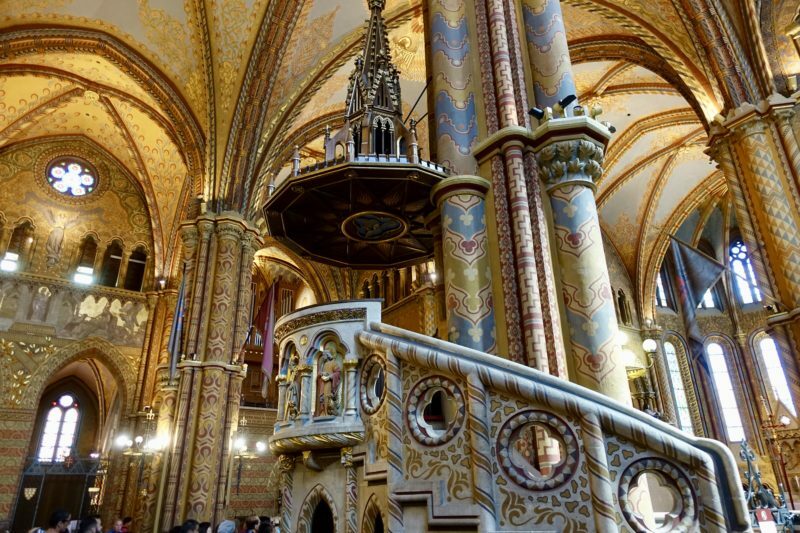 It is stunning, but in a different way to many of the more traditional churches. I think I walked around the whole time with my mouth hanging open in wonder. 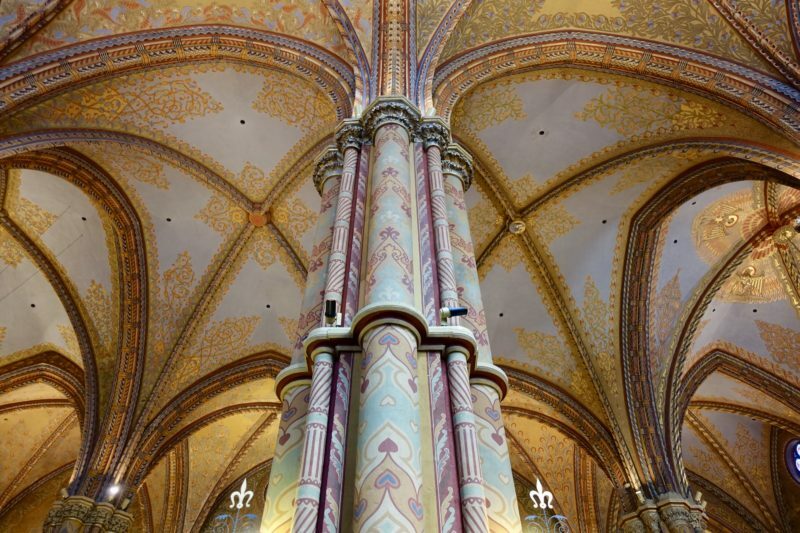 The unusual patterns have been decorating the walls of this church for centuries. 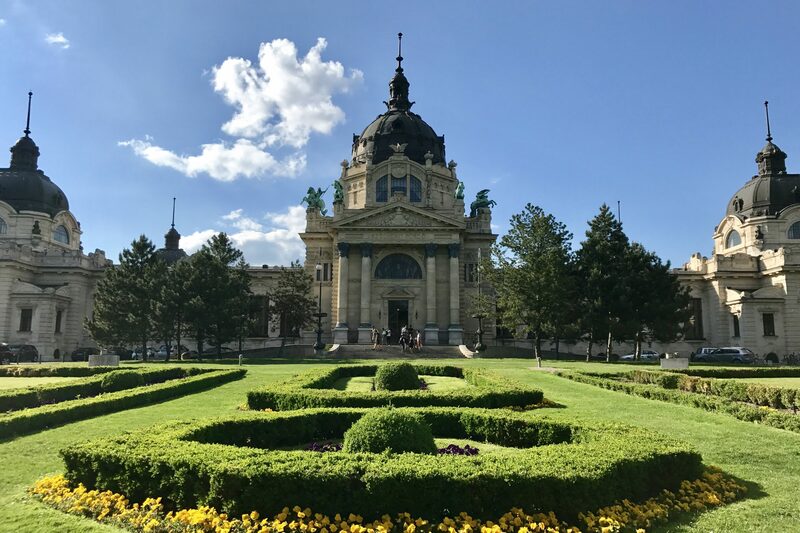 We didn’t go inside of Buda Castle, but we heard about much of the history and wandered the gardens admiring the views over Buda on one side, and over the Danube towards Pest on the other. After the walking tour we went back to the Great market Hall for lunch. It was open this time, and bustling, but maybe the universe was telling us something on our last visit. Downstairs were all the produce stalls, and in a small amount of space upstairs were the food stalls. It was too crowded for us, and we made a rushed decision that cost us too much and was not very nice to eat! But we live and learn! The kids didn’t eat, so we went back to our apartment and grabbed something from the supermarket for them on the way. The Great Market Hall looks deserted, but that’s because everyone is upstairs having lunch! After a short rest we were ready to go again. The kids decided to stay in, but Simon and I headed out to look at some of the places we had planned to see in the morning. Mostly we were just walking and taking in the sights, enjoying the atmosphere. 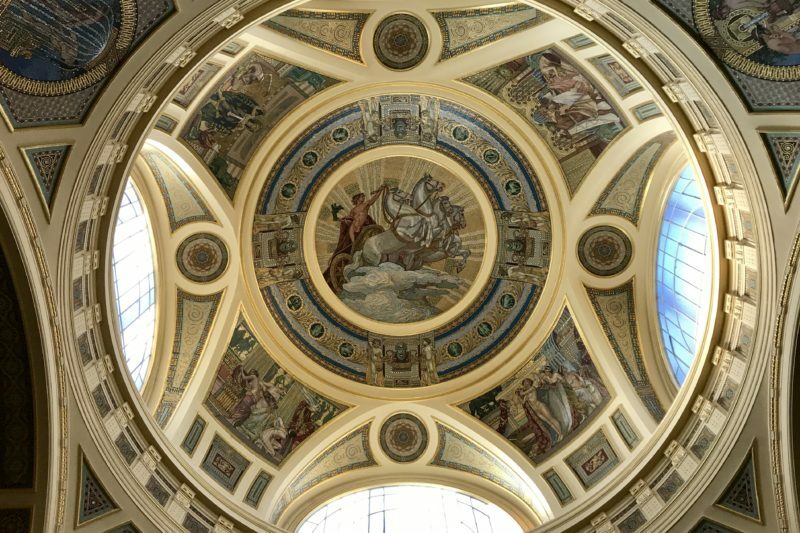 We went to the Parliament building first, the made our way towards St Stephen’s Basilica to see the inside. 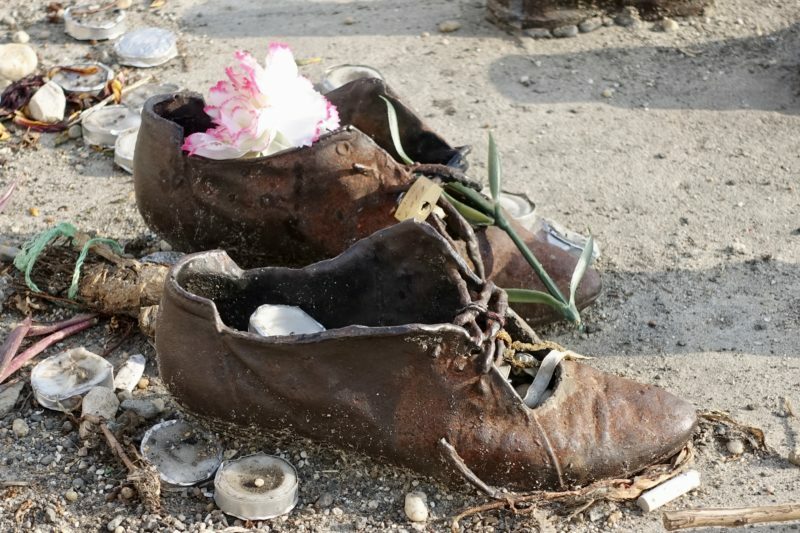 On the way there we remembered we didn’t see the Shoes on the Banks of the Danube, a touching memorial to those killed by the Nazi’s in WWII. It was right near Parliament, so back we went. 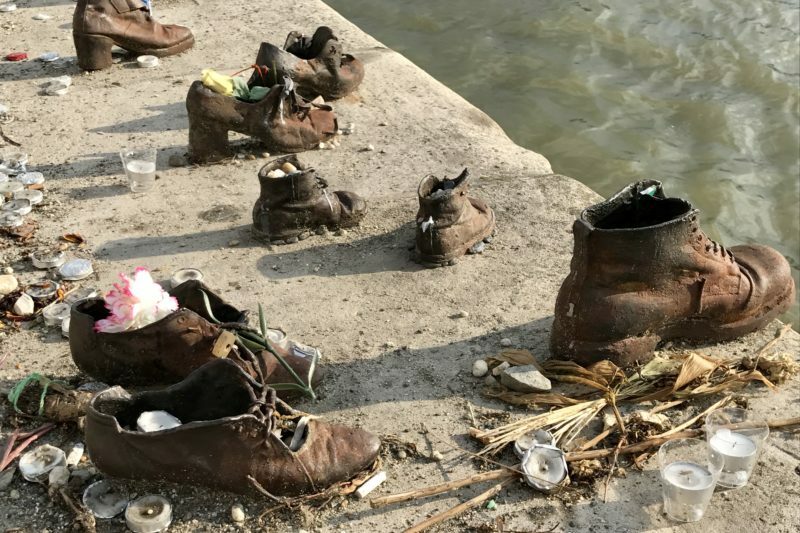 Shoes on the Banks of the Danube. St Stephens Basilica was another beautiful church with extensive stained glass throughout. A service was in progress on our arrival, so we crept in at the back to have a quick peak. This was not the first time we had encountered a service, our timing seemed to be impeccable – even at Notre Dame in Paris we timed it perfectly. 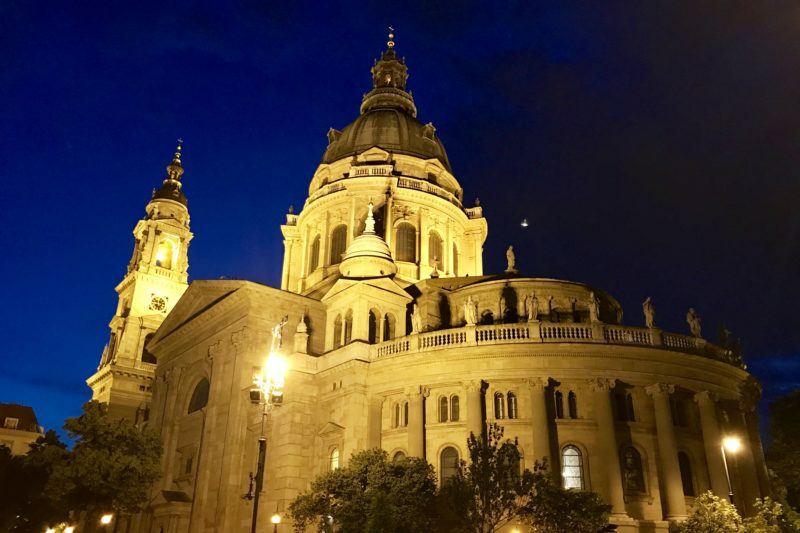 St Stephen’s Basilica is another stunning church worth a visit. A service was going on as we dropped in. Our next destination was a ruins bar. So many people had said we needed to visit one and I was a bit non-committal about it. I mean, I’ve been to plenty of bars, how exciting could these be? Okay, I admit I was wrong! 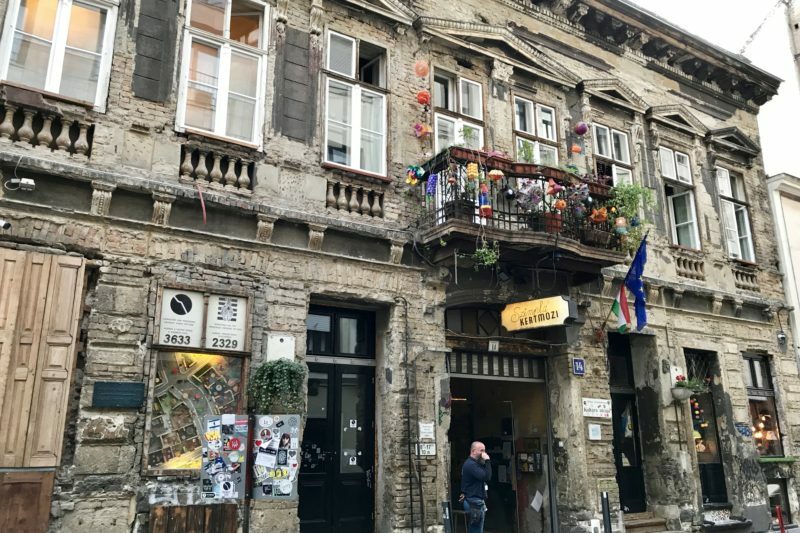 At least, the ruins bar we went to, Szimpla Kert, was interesting and cool. We only had one drink, but then we explored the many different rooms throughout the building. There were lots to see, with both a downstairs and upstairs area, with and outdoor section too. There were multiple bars, a shisha bar, and areas where a band could play. 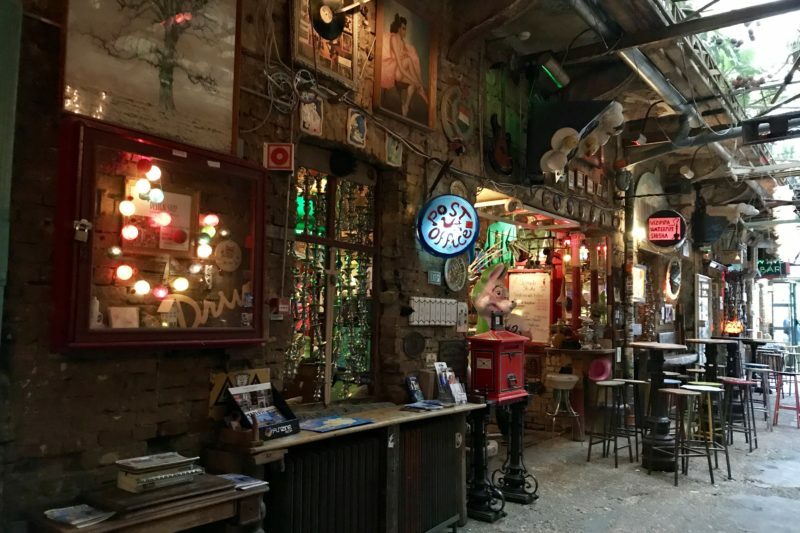 Szimpla Kert ruin bar. The coolest place in town! 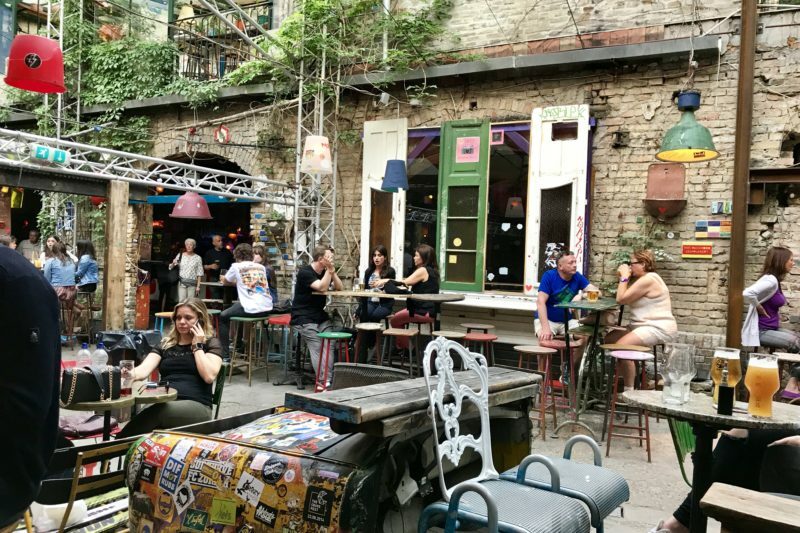 Inside Szimpla Kert there are many different areas with different purposes – the Shisha Bar, the Wine Bar, the Cocktail Bar, The shop…. 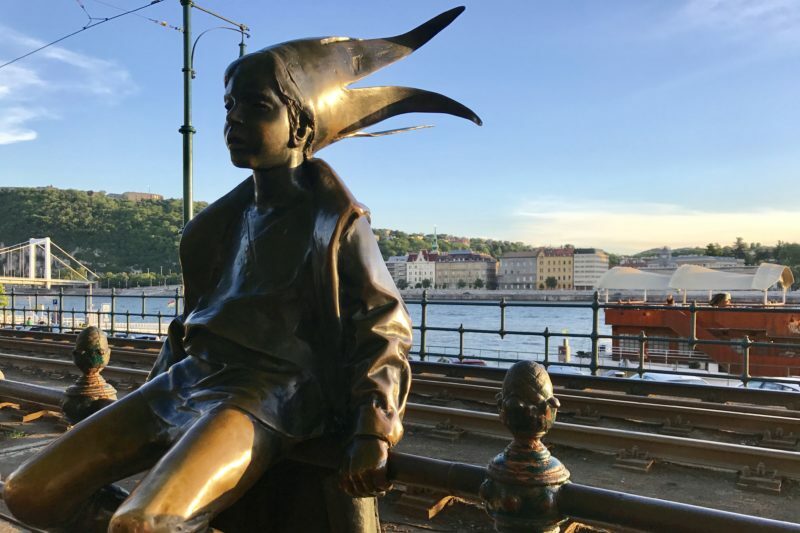 We made our way back to join the kids as the sun was going down, knowing this was our last night in Budapest. We had a morning flight to take us to the next destination on our adventure. 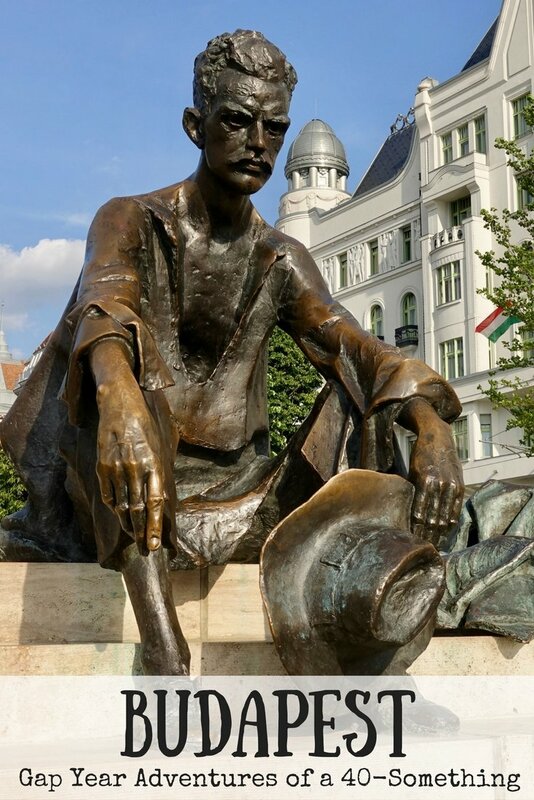 We all felt immediately at home in Budapest. This city has that intangible something that resonated with us. I would have loved to stay longer and explore further, and I am convinced I will be back here again in the future. 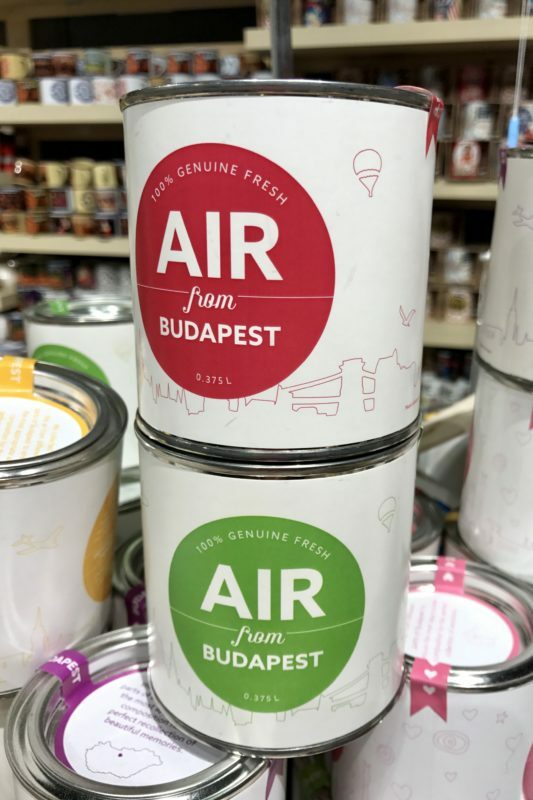 Budapest was generally cheap. Our accomodation was something crazy like $70AUD/night. We mostly bought food at supermarkets at a reasonable price. The one night we ate out (Mother’s Day) we paid about $20AUD per person for a main and drink. We used public transport a little – bus from the train station, train to our walking tour and airport. It was relatively cheap and easy to navigate. I think though we are getting the hang of it all, and Google Maps really helps make it so simple. Tickets (in a book of ten) were approximately $1.40/trip. Mostly we walked around Budapest. It was great to find something new and interesting around each corner. Wifi was relatively plentiful. It was available whenever we ate out, and in some of the shops along Váci Street that we would duck into if we needed directions (Hard Rock Cafe shop, H&M for example). We seemed to be too busy most of the time to worry about internet. 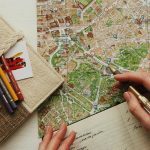 We were finally getting more organised to ensure we knew where we were going before we left our apartment. One of the most ambitious money-making schemes I have ever seen. Do people actually buy these? I think they were €9.95 each! Thanks Carol. It really was lovely. I’m sure I will be back there again some time in the future.